This is one of those lifesavers that will make you look like an absolute genius and get you out of all kinds of trouble. TLC and I arrived home yesterday after a long damp afternoon out. We were both chilled in the wrong way, soaked through and ready for comfort food. A robust dinner to bring the warm back. The cauliflower that needed to be used in the fridge had dictated the course of the meal: a big, fat cauli cheese. It would be perfect with some warm bread on the side to scrape up the white sauce. One problem: no bread. I’d forgotten to put a loaf on for the weekend, and last week’s effort was decidedly green around the gills. I had two choices. I could shrug back into my wet coat and boots and slog down to the shop. Or I could use my mad sick baking skillz and address the situation like a man. This is a moment where soda bread comes into its own. You get a fresh loaf on the table in an hour, from a standing start. It’s simple to make, with none of that tedious mucking about with proving and knocking back. If you’ve never made bread before, this is the place to start. Start by getting your oven up to speed. 200°C, 170 if you’re rocking a fan oven. Grab a big bowl, and measure 500g of plain flour into it, along with a teaspoon of salt and two teaspoons of bicarbonate of soda. Bicarb is the magic ingredient, and does all the rising that you’d normally leave to yeast. It’s a fast and dirty way to lift a loaf. But for it to work you need a live ingredient. Many soda bread recipes call for buttermilk, the byproduct of butter production. It’s not tough to make from fresh, which is worth bearing in mind as the stuff isn’t as easy to get in the shops as you’d like. But natural yogurt will work just as well, and I always have a big tub of it in the fridge for dips and quick desserts. Unflavoured, naturally. Slop about 400ml into the dry ingredients. Now mix it all together, until you get a loose, craggy dough. Add a splash of milk if it looks too dry. Tip the whole mess out onto your worktop, which you’ve lightly floured, and gently knead the dough for a minute. We’re not looking for Paul Hollywood-style pummelling here, and the end result will not be springy and supple in the way you’d expect to see with a normal dough. Go gently. You want a very soft, almost sticky dough that will just hold its shape. Tuck it into a ball shape, and plop the dough onto a greased baking sheet. I used a silicon cake pan, which does as good a job. Deeply slash a cross into the top, and pop it into the oven, which should be hot by now. Set a timer for 40 minutes. the oven rack above it, and move the loaf down a bit if it looks like it’s browning too quickly. But apart from that, no fuss, some muss. Hey, it’s baking. Now wash your bowl and clean down your worktop. Standard rules apply when the soda bread is done. Let it cool on a rack for 10 minutes or so before you tear into it, longer if you can stand it. The cross you cut into the dough makes it easy to rip the bread into wedges. It’s best eaten warm as an edible scoop for anything saucy or stewy. It’ll have a savoury tang from the bicarb and yogurt, and a gloriously crunchy crust. 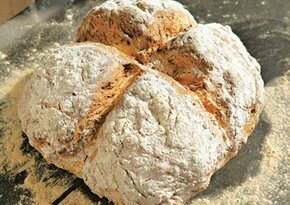 Soda bread will keep for a couple of days after you make it. It toasts brilliantly. Soda bread is an easy way to snag some bragging rights in the kitchen. Making your own is almost stupidly easy. Four ingredients. Ten minutes of actual work. Kudos for days.